Movie Review: “Bone Tomahawk” is an atypical western. To be more precise, it’s a nutty blend of western in its ancient tradition of ebullient battles between cowboys and Indians, dry comedy, and a gory horror thriller. The screenwriter and debutant director, S. Craig Zahler (also a musician, novelist, and former cinematographer), showed sufficient arguments to let us expectant for his future cinematic creations. The fantastic cast manifests a salutary diversity: from valued veterans, cases of Kurt Russell and Richard Jenkins, to solidly established actors such as Patrick Wilson, to auspicious young talents like Matthew Fox and Lili Simmons. The film opens with a man cutting a human throat and explaining to his accomplice that there are 16 major veins in the neck and that he needs to cut them all. Minutes later, he’s killed by an arrow shot that flew mysteriously from nowhere. It’s a sufficiently interpretive premise for the grueling scenes that will come later on, especially in the last 30 minutes, when the brutality assumes total control of the story. Set in a tiny town, the story focuses on the earnest sheriff Franklin Hunt (Russell) who seemed more than happy to embark on a perilous mission across the old Wild West in order to solve the mystery related to the disappearance of the town’s doctor, Samantha O’Dwyer (Simmons). Assisted by his two quirky deputies - the irreverent and boastful gunman, John Brooder (Wilson), and the decrepit and jocular, Chicory (Jenkins) - who are so contrasting in nature that end up complementing each other, the brave sheriff sadly concludes that the woman was abducted by savage Indians who, in addition of having no name nor language, also have the particularity of being cannibals. Even seriously wounded in a leg, Samantha’s husband, Arthur O’Dwyer (Fox), decides to join the mission, regardless if his dragging pace lets him momentarily behind. 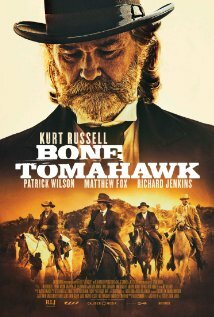 “Bone Tomahawk” can be described as a super-violent, unsparkling western adventure whose excessively sanguinary atrocities will be the first thing to become retained in the mind of the majority of its viewers. In my personal case, the often-unreasonable wry humor and the well-chosen settings were the aspects I most cherished.